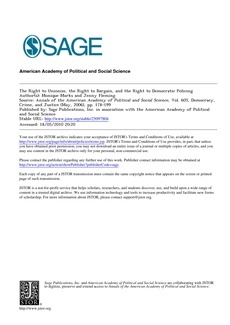 � 2006 American Academy of Political and Social Science. This (normative) article explores the importance of police unions in the quest for democratic policing. The authors argue that if we are to expect police to behave democratically, it is important for police themselves to experience democratic engagement within the organizations in which they work. That is, if police are expected to defend democracy, they should not be denied basic emocratic rights such as the right to collective bargaining and the rights such as freedom of association. The authors contend that police unions, through networking with other social justice groupings and through encouraging democratic practice, constitute a real forum for the promotion of democratic policing. For this potential to be reached, however, police unions need to identify with broader labor movement trends toward community unionism.